Looking for the top of the comfort in modern and comfortable veichles? A relaxing ride by our minivan is what you need! A private tour of Rome by bikes is the best opportunity to enjoy a deep and wide exploration of the Eternal City. Cheapest tour, suitable for all the budgets. 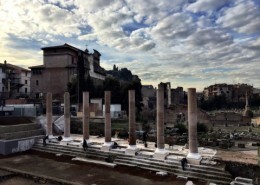 The most panoramic Rome Tour. A trip across the alleys and the panoramas of the city of emperors and popes ... accommodated on a three wheels couch. Hop on an iconic Vespa to taste truly the flavour of the Italian Lifestyle. Fastest and cheapest way to explore Rome’s Highlights. Tailor made visits, skip the line admissions in the Colosseum and the Sistine Chapel. 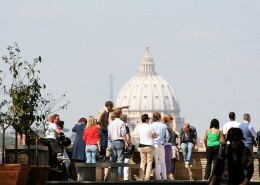 Classic guided walking tours maybe to enjoy fully your brief stay in the city the Emperors and the Popes. 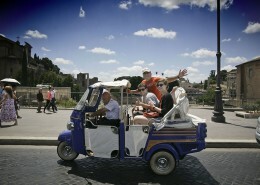 Looking for the funniest and coolest tour in Rome? Ready to be the city attraction? A trip inside our shining vintage Cars is the unforgettable experience. Looking for the top of the comfort in modern and comfortable veichles? 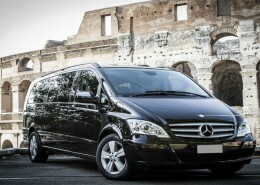 A relaxing tour of Rome by Sedan car is what you need! 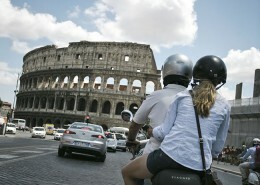 Selfdrive trip of Rome by Vespa is the Adrenaline experience you were looking for. A top notch sightseeing highlights of your Roman Holiday. Born and raised in Rome, we truly know best way to explore our beloved eternal city. We did our first tours by Vespa, Bike and Fiat500 when, years ago, we were showing Rome to our friends and…girlfriends. We didn’t know, in the 90s, we were riding trough the roads of our destiny. With the same passion for the beauty, art and history, and with much more knowledge and experience, today we explore nooks and crannies of the city of popes and emperors with you. Since 2009, Dearoma Tours exists as a Licensed Tour Operator, leader of the vintage wheels adventures in Rome, trusted company for the classical sightseeings of the Vatican and Colosseum. Dearoma Tours & Travel is first of all a quality choice. We deeply believe that the care of the details joined to the construction of a tailor made experience could truly offer our clients, leaving for the world or visiting our dear Rome, moments to remember for a lifetime. The attention for the safety is always the main element of our tours and sightseeing. Before leaving our staff use to verify the bikes and scooters customers driving skill. It’s a very important test necessary to ride in the necessary safety condition. In absence of those conditions, our policy also provides a refund of the cost of the tour. When left, our clients have only to follow our Guides and to trust in their insiders Rome secrets skills. 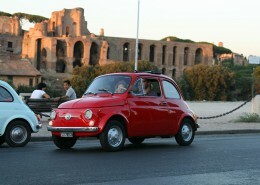 They will lead you in safety to enjoy driving, trough the maze of the Eternal City. The skills and enthusiasm of our main Guide, Valerio, won, years ago, the shyness of the first customers,and made products such as the Vespa Tour di Roma one of the most exclusiveand entertaining tours of the Eternal City. The decade of experience in the Travel&Leisure world of Cristiana is, daily, at your disposal in our Campo de’Fiori square. We sell Travel and Tours, we offer products that have to deal closely with human emotions (that’s why we love our work). We want to keep in mind that when we quote our experience to be always ready to redefine the details of any fee to allow anyone, singles, couples and wonderful families, to enjoy what they want. Thanks to a special deal with Allianz-Global Assistance, Dearoma Tours & Travel was able to take out a a policy exclusively dedicated to our customersIncoming. Each Tour and Sightseeing is sold including of a personal Insurance Interassistance 24su24.Insurance Policy Conditions here. Dearoma Tours & Travel offers the garancy of a private experience. Our guides believe in the importance of the sole passions and wishes of each client. Choosing Dearoma, you chose the freedom to decide of your ideal route, with your exclusive Guide, without interfering with other customers. 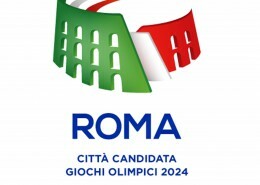 Dearoma Tours & Travel is a Travel Agency and Tour Operator with regolar licence released by the Province of Rome. This means relying on an operator who ensures customers all the legal protections required for effecting legally the sale of Travels, Tours and excursions in Italy.